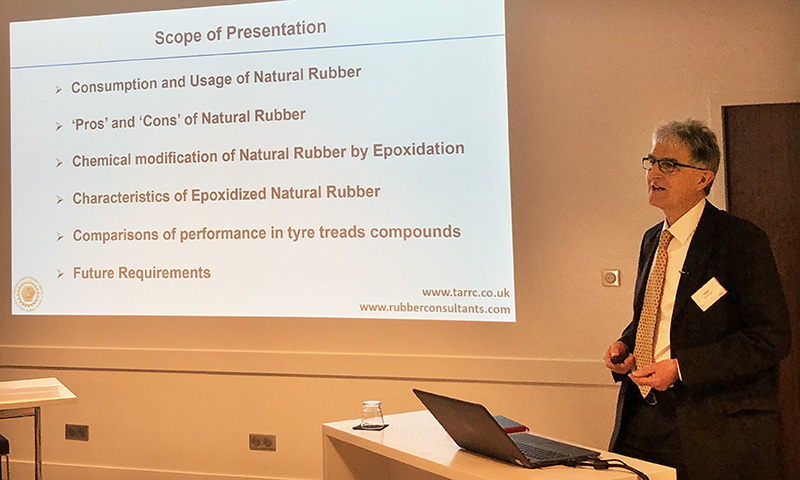 TARRC's Director of Research Dr Stuart Cook presented a paper on ‘Modification of Natural Rubber for Enhanced Performance’ at the 6th World Elastomer Summit from 27th - 28th March 2019 in Lyon, France. Dr Cook's paper and was about the benefits brought about by epoxidation of NR latex. Over the two days, the participants discussed the most urgent and current questions of the industry, from feedstocks, natural rubbers, elastomers production, TPE, to tyre design, technologies and other applications for elastomers. The 6th World Elastomer Summit brought together senior executives from petrochemical companies, elastomers & rubber producers, product manufacturers, technology providers, chemical intermediate suppliers, researchers, as well as other influential stakeholders from the value chain.